While talking with a fellow classmate about past relationships, the conversation quickly progressed into her romantic situation. She informed me that she met her current boyfriend of almost three years online. “I can’t handle online dating,” I said, “that’s how I met my last boyfriend and I don’t want to go back there.” Refusing to spend money on an online dating site, I had only used free trials of Zoosk, eHarmony, and the always-free Plenty of Fish. I can’t remember my precise reaction to this, but I’m confident it was a mix of shock and intrigue. Up until then, I had only ever used Craigslist to sell my textbooks and look for a cheap replacement cellphone. I was supposed to meet my next great love on a website that also included postings for farm equipment and used shoes? I didn’t want to admit that I was already considering going back to Plenty of Fish, so I told her I would try it. Worst-case scenario, I would just delete the posting I put up. That’s exactly what I did. 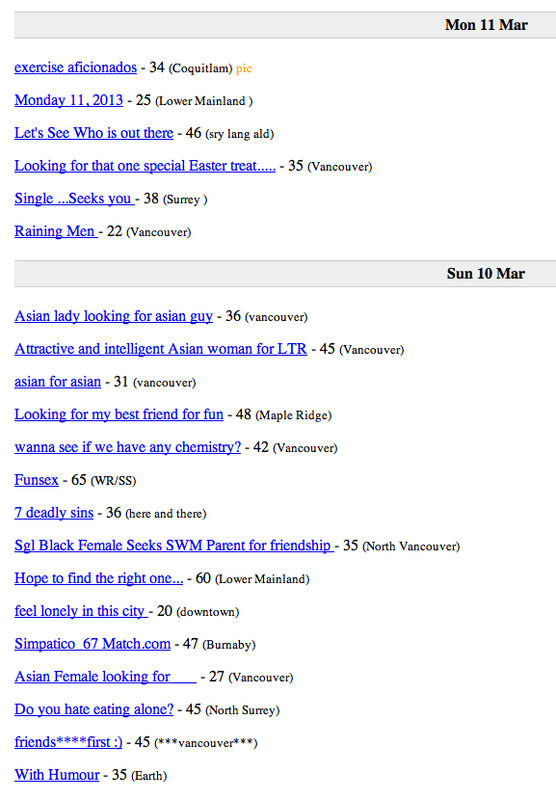 After having a short paragraph about myself on Craigslist for only an hour, I got over 60 replies. I deleted the mini profile for fear that my computer would soon crash, and processed the replies I already had. Since I wasn’t new to the world of meeting people online, I’ve developed what I like to think of as a rigid screening process; never answer anyone who only says “hey”; always subtract two inches from how tall a guy claims to be; never reply to someone who over-uses internet slang or makes too many spelling errors; always decline an invitation to be picked up from your house. Out of that batch of over 60 messages, a lot were horrific. I got a message from a man describing all of his tattoos. I wasn’t opposed to this until he told me that he had a neck tattoo. That alone would have been enough to make me hit delete, but he went on to tell me that the tattoo on his neck was of his kid’s name and that he was actively pursuing supervised visits. Next. I got a message from a 72-year-old man who was confident that had I been somewhere in my 40s, we would have made a great couple. Next. One of the better messages that came in was from a guy employed by the city of New Westminster who claimed to like reading and hanging out with his dog. He gave me a fake number. Next. One of the last messages I got was from an architecture student who wanted to take me out for coffee. After exchanging perfectly punctuated and grammatically correct emails, and eventually text messages, I agreed to meet him. I figured if nothing else, I was getting a free beverage out of the whole ordeal. What I got was four dates in 10 days with an attractive, interesting, and comical guy. I’d call that a success. Thanks, Craigslist.